Mr. P.V. Narasimha Rao, Minister of Foreign Affairs, Government of India, Chairman. Mr. A.M. M’Bow, Director General of UNESCO, Member. Mr. J.R.D. Tata, Chairman Emeritus Tata & Sons, Member. The international township known as ‘Auroville’ located in South India has, in spite of a difficult period through which it passed during the last several years, emerged as a unique collective experiment ready for further development and growth towards a realisation of the ideals enunciated in its Charter. We are gratified that the Government of India has intervened in 1980 to give the necessary protection and encouragement to the residents of Auroville in continuing their tasks of building Auroville and its growth through progressive collective experiments. Auroville is a cultural township of special significance engaged in material and spiritual research embracing science, philosophy, arts, crafts and technology. Auroville has taken steps to achieve an ecological balance in its environment with particular emphasis on afforestation, land reclamation and erosion control. It is likewise making useful experiments utilising alternative energy sources including solar energy, wind energy and biogas. It has also undertaken, in the context of the ideals of continuing education and a learning society, important educational research that is relevant to the children of today and tomorrow. We are happy to commend Auroville to all interested persons throughout the world, including UNESCO and other international organisations. We are convinced that the valuable experiment that Auroville represents will continue to flourish and become, in due course, a model of international understanding and inter-cultural harmony in its quest for human unity. I know that Auroville won’t fail…. Perhaps there is nowhere in the world this kind of spirit and this kind of faith, a visible belief in oneself and in the goodness of people. Mr. J.R.D. Tata, Chairman Emeritus Tata & Sons, Dr. Ervin Laszlo, Director World Future and Secretary General of The Club of Budapest; Snr. 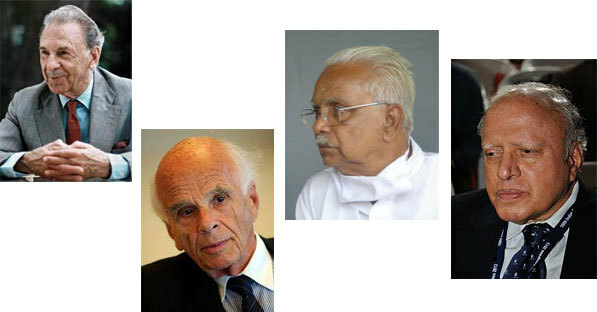 Federico Mayor, Director General of UNESCO; Mr. Bertrand Schneider, Secretary General of the Club of Rome, and Mr. Maurice Strong, environmentalist, were appointed by the Government of India as members of the 2nd International Advisory Council. The Council met for the first time in Auroville on 27th February 1993. Of the five members only Dr. Ervin Laszlo and Mr. J.R.D. Tata were able to attend the meeting. Snr. Mayor’s deputy at UNESCO, Mr. Sharma, attended in his place. In this rampaging world, Auroville could be a sort of model, a hope, as you are pioneering a new way of organisation, a new way of life. But Auroville still has much more to achieve in this, and Auroville remains unknown by many people. Perhaps in the future, other Aurovilles could be created in India. (…) Auroville is not just an idea. It is the future, the future of the world. It is the only model that I know of that has survived, and I believe in it more today than ever before. I’ve come here today to breathe the Auroville spirit. I’m not an Aurovilian, but I have the Auroville spirit! I’m deeply touched to be here. Coming here for me is like returning home. In fact, I think I’ve been on the way to being an Aurovilian all my life. If you Aurovilians can solve some of the problems of living with yourself, with community and with nature and the environment, and you can create a new world here, then there is truly hope for humanity. On the occasion of Auroville’s 28th anniversary, I am pleased and honoured to share in the celebrations, and to add my voice to those who wish to uphold the city of Auroville as a shining example of community building with solidarity with humans, empathy with living nature, and care for the physical environment. Today one of my primary concerns is that our planet is seriously endangered due to our environmental crisis and our lack of respect for the natural laws and the sacred aspects of nature. One of the interesting aspects of the Auroville experiment is that the community has done exemplary work in reforestation, appropriate technology, renewable energy, environmental education, low-cost environmental housing, traditional medicine, seed banks, and training programs in sustainable and appropriate agriculture. Knowledge and research from Auroville is shared with people from India and the world. (…) Auroville is one of those special places on earth where people are trying to return to a spiritual basis of life and to provide a model for appropriate planetary consciousness. In 1999, the Government of India appointed the new members of the 3rd International Advisory Council: Dr. Amartya Sen, Master of Trinity College, Cambridge, and Nobel Prize winner for Economics 1998; Dr. A.T. Ariyaratne, founder and President of the Sarvodaya Shramadana movement in Sri Lanka and former winner of the Gandhi Peace Prize; Ms.. Mary King, formerly head of the Peace Corps under President Carter, and now resident scholar at the Centre for Global Peace at the American University in Washington; Mr. Kireet Joshi, ex-Educational Advisor to the Government of India; and Prof. Norman Myers, Honorary Visiting Fellow at Green College, Oxford University, and well-known consultant in environment and development. The new Council met for the first time in Auroville on 10th January 1999. All members were present, except Dr. Amartya Sen, who had recently been awarded the Nobel Prize for Economics. I spend a good part of my life running around in universities and research centres, and I am often reminded of that person who once said: ‘when all is said and done, there is still a lot more said than done’. But in Auroville, you are getting on with it; you do not think about it, you live it. (…) Aurovilians are fortunate to be right in the front-line of this magnificent experiment… I wish much joy in your work, in your lives together, in your aspirations, in your dreams. When I visited Auroville for the first time last year, I was very struck by your accomplishment in afforesting this formerly barren land, and by your work on clean and renewable forms of energy. In terms of environmental initiatives world-wide, you are definitely at the sharp end of the pack. But two things impressed me even more. Firstly the spiritual aspect, the fact that people here are fully committed to the ideal of human unity and, secondly, your attempt to organise yourselves through a process which I have heard described as ‘creative anarchy’. I’m struck by the way you discuss and discuss issues until a decision bubbles to the surface – you don’t so much take a decision as see what emerges. Auroville as a spiritually-based community using the most modern technology could be a centre for social transformation in the villages around. It could be like the centre of the lotus with the villages as petals. This is how I look at this place. This century has seen mass slaughter tribal warfare and ethnic cleansing. If ever there was a time to talk about human unity, this is the moment. This is the time when whatever lessons you have learned here should be shared. This is the time when Auroville’s light can really shine for the whole world.